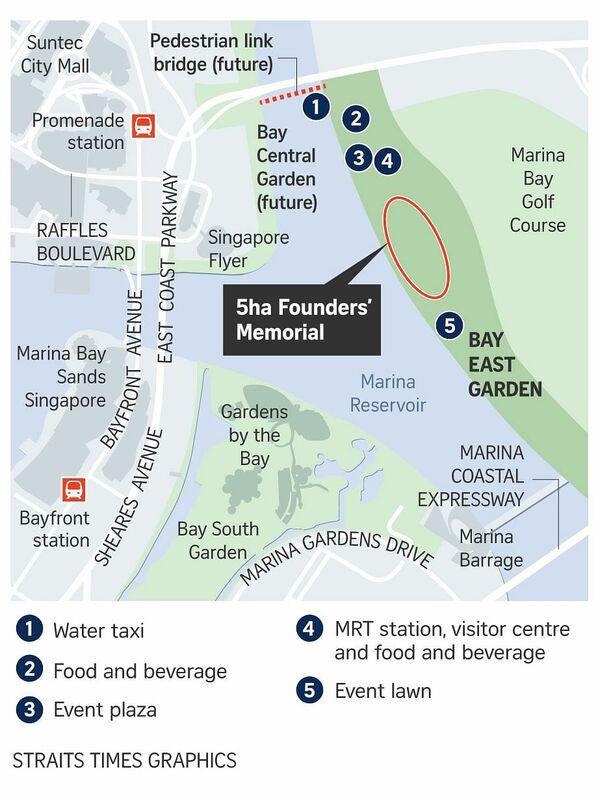 SINGAPORE - An international design competition has been launched to call for proposals for the upcoming Founders' Memorial, which will be constructed in the Bay East Garden in Gardens by the Bay. The competition, which opened on Thursday (Jan 10), invites architects from all over the world to take part in a bid to be appointed for the project. Mr Lee Tzu Yang, who is chairman of the Founders' Memorial Committee, said that the winning design should "honour the founding values of this country and make excellent use of the site". "We envision that it will be a space which everyone of all ages can enjoy and relate to, and an icon that Singaporeans can be proud of and share with our future generations," he said. "We are not looking for statues; we are not looking for depictions of iconographic people." The competition will be organised in two stages, with participants required to submit designs for the first stage by April. A jury panel will shortlist up to six designs, and public engagement workshops will be organised to get Singaporeans' thoughts on them. The shortlisted participants will then further develop their designs for stage two before the winning entry is announced at the start of next year. The Founders' Memorial will be housed in a garden, within which an indoor gallery will be built. There will likely be permanent and temporary galleries, as well as a visitor centre and multipurpose rooms which could host school excursions and citizenship ceremonies. More than 32,000 people have been asked - through dialogues, surveys and workshops - what they wanted to see from the memorial. Groups of historians, educators, architects and students have also been consulted. One of the factors the jury panel will consider is whether the project is within budget, although the exact budget is still being worked out. International firms will be encouraged to partner with local ones in the first stage, and will have to do so in stage two. The memorial is expected to be completed by 2027, and attract one million visitors a year. Mr Tai Lee Siang, one of seven members of the jury panel along with Mr Lee, added that the site must be "carefully and properly planned". "It will set the tone for the rest of the Bay East Gardens design," said Mr Tai, executive director (BuildSG) at the Building and Construction Authority. The Singapore Institute of Architects has been appointed by the Founders' Memorial Committee, through the National Heritage Board, to organise the competition. Landscaping will be an important part of the design. Proposals should also take into consideration the connectivity and accessibility to the site. Plans for the area include public road access, a new pedestrian bridge and water taxi stop, as well as the new Founders' Memorial MRT station.